Ready to get started with SIOP®? Start with this book! This book introduces and explains the SIOP® (Sheltered Instruction Observation Protocol) Model, a comprehensive, coherent, research-validated model of sheltered instruction, now implemented in districts throughout all 50 states and in dozens of countries. The SIOP Modelimproves teaching effectiveness and results in academic gains for students. 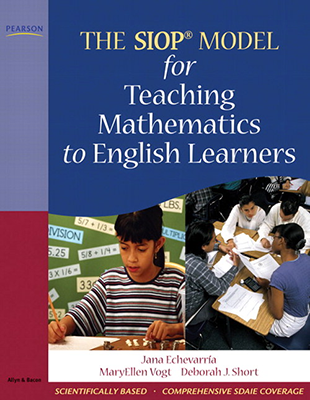 The SIOP® Model, developed by the authors over 15 years ago, offers teachers a comprehensive, well-articulated model of instruction for planning and implementing lessons that helps educators a) provide English learners and other students with access to grade-level content standards, b) develop the students’ academic English skills, and c) prepare students to be college and career ready. The only research-validated model of instruction currently available for teaching English learners, the SIOP® Model is applicable across content areas and is now being implemented at all levels of education from Pre-K to community colleges and universities. The new edition provides specific applications of the SIOP to the Common Core and other state standards and includes a Reflect and Apply eText feature in which readers explain their rating of teachers’ lessons, Teaching with Technology vignettes that describe how to infuse technology into many different SIOP lessons, and new video links inserted throughout to illustrate chapter topics and discussion points. Check for Understanding and end-of-chapter quizzes provide a comprehensive means for gauging student understanding. The Enhanced Pearson eText provides a rich, interactive learning environment designed to improve student mastery of content with embedded videos and assessments. The Enhanced Pearson eText is also available without a print version. 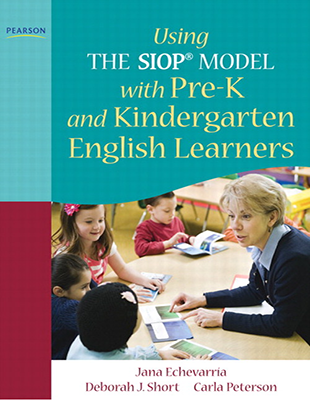 This new addition to the best-selling SIOP® Model series shows how to use the SIOP® Model with pre-K and kindergarten English learners so they can fully participate in all aspects of early schooling. Understand the young English learner and language development, learn all eight components of the SIOP Model (lesson preparation, building background, comprehensible input and strategies, interaction and lesson delivery, practice & application and review & assessment), and see how other programs have used the SIOP Model to create an optimal learning environment for their young students. Focuses on preschool-aged children and kindergarteners—and shows how to create an effective and developmentally appropriate instructional setting for these young English learners. 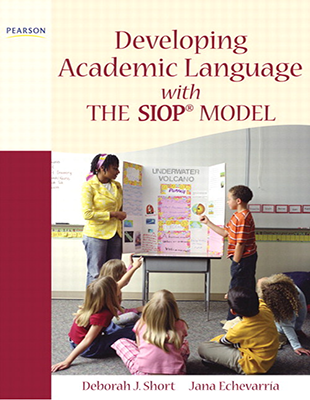 Provides an overview of the SIOP Model—and explains its research support and application to early childhood programs. Describes the young English learner, current demographic trends and the fundamentals of language development early in the book—to provide a context for later material (Chapters 2 and 3). 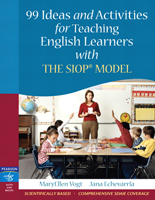 Devotes four chapters to the eight components of the SIOP Model—so educators learn how to use lesson preparation, building background, comprehensible input and strategies, interaction and lesson delivery, practice & application and review & assessment with their young English learners (Chapters 4-7). Provides a sample lesson plan and highlights three sample programs—so educators can see how to implement the framework in different settings and circumstances. Includes a comprehensive version of the SIOP protocol and an abbreviated version—so educators learn how to use the tool to observe lessons, provide feedback, and support other teachers (Chapter 9 and Appendix A). In Developing Academic Language with the SIOP® Model, teachers and teacher candidates get an informative look at how to use the highly effective SIOP Model to design effective lessons that meet high standards, while scaffolding content information and promoting language skills and development for all students—English learners and native English speakers alike—in today’s age of the Common Core and other state standards. The focus is on ways to develop and advance English learners’ proficiency in academic English across all grades and all subjects so they are able to access and acquire information related to academic topics; communicate and produce information in academic contexts; and create and extend knowledge through linguistic, conceptual, and sociocultural choices. The book is packed with practical guidelines, activities, techniques, and sample lessons. The Perfect Companion to Making Content Comprehensible for English Learners: The SIOP® Model!!! This long-awaited new book by acclaimed authors MaryEllen Vogt and Jana Echevarria offers research-based, SIOP®-tested techniques for lessons that include the eight SIOP® components. The 99 ideas and activities in this book include a few familiar techniques that have been shown to be especially effective for ELLs, as well as many new ideas for SIOP® teachers. All promote student-to-student and teacher-to-student interaction and involvement proven to be so necessary for English language acquisition and content development. This book is surely to become an indispensable resource for teachers of English learners. 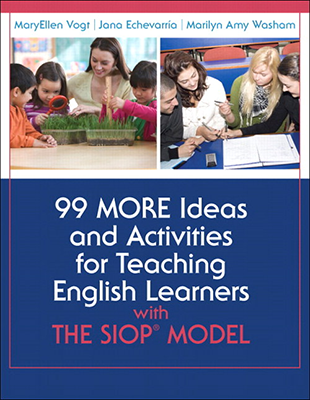 What makes 99 Ideas and Activities for Teaching English Learners with the SIOP® Model a must-have? Offers step-by-step directions and examples of content and language objectives for all ideas and activities. Provides use-tomorrow ideas and activities for implementing the eight components of the SIOP® Model. Includes 12 sample lesson plans that illustrate how a particular activity can be effective for ALL students, and all of these sample lessons are adapted for both elementary and secondary students. Features classroom-ready content and language objectives for all relevant activities. The SIOP ® model is proven to be one of the most effective methods of teaching our English learners. 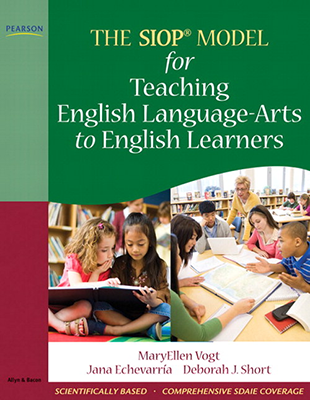 Now teaching with SIOP is even easier with the second volume of Vogt, Echevarria, and Washam's 99 MORE Ideas and Activities for Teaching English Learners with the SIOP ® Model. Offering brand new, classroom-ready activities, this indispensable resource revisits SIOP ® and shows how to use it each day in the classroom. Whether searching for activities that build vocabulary, keep students highly engaged, or make content concepts clear, these teacher-tested strategies adhere to SIOP ® principles and reinforce best practice. Chapters are organized around SIOP ® 's eight components and thirty features, so teachers learn not only what activities to try, but also why they work. With its dual focus on implementation and understanding, this must-have resource helps you create a classroom where students progress both academically and in their English language proficiency. Trusted by more than 350,000 educators, the Sheltered Instruction Observation Protocol (SIOP ® ) Model provides the key to best practices for teaching English learners. Now, in response to the overwhelming success of the SIOP ® Model, the renowned author team has crafted a fresh, indispensable resource for educators, Implementing the SIOP ® Model through Effective Professional Development and Coaching. 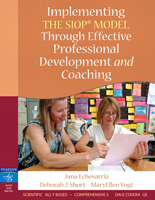 This book empowers teachers, professional development coordinators, coaches, and administrators with complete access to the “how” and “why” of the SIOP ® Model–from getting started to sustaining the program–all in one place to meet your professional development and coaching needs. Voices from the Field: Educators from sixteen U.S. school districts share their stories about the challenges and the successes in meeting the needs of their ELLs. Their suggestions include school and district-level SIOP ® implementation strategies for success. Models of SIOP ® Implementation: There is no one-size-fits-all approach; the authors offer a variety of models of implementation so you can find one that most closely matches your own school or district context. Coaching Do’s and Don’ts: Current SIOP ® coaches tell how they have set up coaching programs and formed SIOP ® teams at their schools, and discuss what expertise SIOP ® coaches need and how their responsibilities may differ from those of other coaches. Classroom Implementation of the SIOP ® Model: Classroom teachers have the greatest responsibility for providing effective and appropriate instruction. This book offers specific recommendations for creating SIOP ® -based classrooms that truly promote academic literacy and content learning. Implementation Tools: You will find a wealth of resources from sample agendas for SIOP ® staff development and classroom observation checklists to lesson plan forms, self-assessment tools, and coaching tips–all to help you successfully implement the SIOP ® Model. Enhance your Science content instruction with the SIOP Model and transform the academic English and science skills of your English learners. 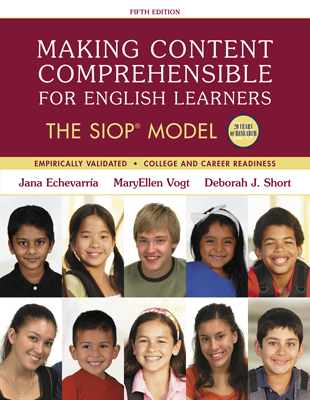 Based on the best-selling resource, Making Content Comprehensible for English Learners: The SIOP Model by acclaimed authors Jana Echevarria, MaryEllen Vogt, and Deborah Short; teachers, coaches, and intervention teachers have access to research-based, SIOP-tested techniques for lessons specifically for the science classroom. 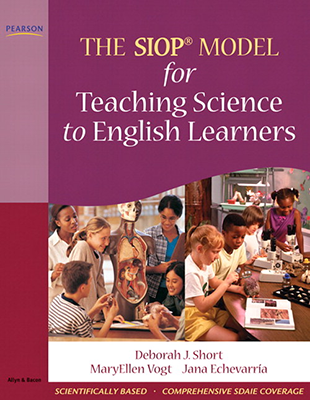 This highly anticipated book, The SIOP Model for Teaching Science to English Learners addresses the issues faced in teaching science to English learners (ELs) at each grade-level. SIOP techniques and activities organized around the eight SIOP components guide educators in promoting academic language development along with comprehensible scientific content. Written for SIOP teachers and those who have learned the SIOP Model, this book includes proven, effective science lessons and comprehensive units. In addition, this book provides ideas to adapt the techniques for students at different levels of English proficiency. This book is sure to become an indispensable resource for science educators of English learners. · Presents a systematic process for teaching both the academic content of science and its associated academic language to English learners. · Offers ideas and activities about teaching science and organizes activities by grade-bands—K-2, 3-5 (or 6), 6-8, and 9-12 and SIOP components. · Provides use-tomorrow ideas and activities for implementing the eight components of the SIOP Model in a science classroom. · Includes lesson plans and comprehensive units that illustrate how a particular activity can be effective for ALL students, not just English learners. Enhance your History-Social Studies content instruction with the SIOP Model and transform the academic English and content area skills of your English learners. Based on the best-selling resource, Making Content Comprehensible for English Learners: The SIOP Model by acclaimed authors Jana Echevarria, MaryEllen Vogt, and Deborah Short; teachers, coaches, and intervention teachers have access to research-based, SIOP-tested techniques for lessons specifically for the History-Social Studies classrooms. 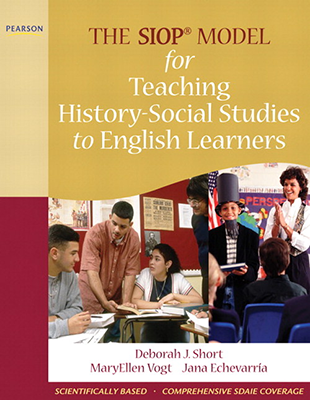 This highly anticipated book, The SIOP Model for Teaching History-Social Studies to English Learners addresses the issues faced in teaching history-social studies to English learners (ELs) at each grade-level. SIOP techniques and activities organized around the eight SIOP components guide educators in promoting academic language development along with comprehensible content. Written for SIOP teachers and those who have learned the SIOP Model, this book includes proven, effective lessons and comprehensive units. In addition, this book provides ideas to adapt the techniques for students at different levels of English proficiency. This book is sure to become an indispensable resource for history-social studies educators of English learners. Presents a systematic process for teaching both the academic content of history-social studies and its associated academic language to English learners. Offers ideas and activities about teaching history-social studies and organizes activities by grade-bands–K-2, 3-5 (or 6), 6-8, and 9-12 and SIOP components. Provides use-tomorrow ideas and activities for implementing the eight components of the SIOP Model in a history-social studies classroom. This authoritative guide for ensuring all students are able to achieve high standards is an essential resource for educators in any school with English learners. 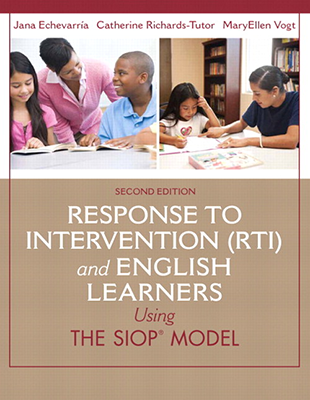 It provides practical help for designing and implementing effective RTI programs using the SIOP® Model, and ensuring the appropriate type of instruction that English leaners need and deserve. Response to Intervention (RTI) and English Learners, 2/e includes important background information on RTI; examines the academic and linguistic challenges that English learners face; and covers appropriate and effective multi-tier instruction, assessment, and intervention with RTI, specifically for English learners. The authors include recommendations for implementing the eight components of the SIOP® Model for Tier 1 within an RTI framework, and additional suggestions for implementing RTI in secondary schools.